If you're off to Glastonbury this year, then you're probably all but packed and mentally steeling yourself for the oncoming rain. I'm much, much less well prepared. The 2014 festival headliners include Arcade Fire, Metallica, Kasabian, and other huge acts with which you'll undoubtedly have some familiarity. So instead of talking about them, we've rounded up a selection of new-ish acts that you might want to check out over the course of Glastonbury 2014. We caught Annie Eve at Bushstock 2013, accompanied by a full band, and we were reminded of Daughter. With her debut album out in August, this is a good time to catch an exciting act on the rise. Probably the most established act on this list, but certainly one of the most under-rated. We were first entranced by the experimental sounds of Duologue back in 2010, and their Radiohead-meets-Patrick Wolf fare works similarly well in the live environment. It was less than a year ago that we caught this singer-songwriter play for about a dozen people at Southsea Fest. Ezra was thoroughly charming, and performed suitably impressively, despite the relatively small crowd. He'll likely have a much bigger audience at Glastonbury, and we're expecting a performance to match. It's difficult not to find Andrew Hozier-Byrne's hearty vocals anything other than utterly arresting. Having made an impression with the domestic release of 'Take Me To Church' (which hit #2 in the Irish singles chart), he is starting to make a wider move - even playing on 'The David Letterman Show' recently. Probably most famous for her appearance on Clean Bandit's all-conquering smash hit 'Rather Be', Jess Glynne stepped out on her own earlier this year. Alongside her powerhouse vocals, Glynne seems to have the verve to deliver a storming set - let's hope she has a few more top tracks like 'Home' up her sleeve. One of our favourite acts from The Great Escape in May was this delectable solo artist. Not only did she give out free tea bags (with a free download link for one of her tracks, #marketing), she also won over the crowd with her witty chat and brave/surprisingly successful attempts at audience participation. Winners of the 2014 Emerging Talent Competition (of which we were again honoured to be part of the initial judging team) and a popular winner, from what we've heard. They mix all kinds of influences, including jazz and hip hop - perfect for a festival famed for its eclecticism. With 'Steamroller', this Norwich outfit have one of the sounds of the summer. Hopefully it'll become a bonafide festival anthem at Glastonbury. Make it so. 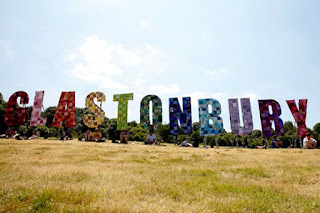 Find more info at glastonburyfestivals.co.uk.